The Other Palace has just announced two 'Work in Progress' productions, first discovered during Pitch Days held on 24 May 2017. SPILT MILK and EVER ONWARD will have public sharings on Friday 11th August at 10.30am and Friday 24th November at 2:00 pm respectively. Pitch Days at The Other Palace offer artists and creative teams the chance to show 20 minutes of their work to Artistic Director Paul Taylor Mills and The Other Palace programming team. These days are aimed at people who prefer to share their work 'live'. The panel then make recommendations about how best to move the project forward, and are delighted to be bringing SPILT MILK and EVER ONWARD to The Other Palace for 'Work in Progress' performances to further their development. Paul Taylor Mills, Artistic Director said, "I am thrilled that we have been able to, within the first 6 months of operating, find two brilliant new musicals to support and develop. This is at the heart of what we want to achieve at The Other Palace and I'm looking forward to working with the teams behind these two new projects." 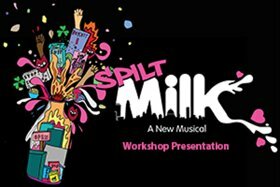 SPILT MILK is a new musical featuring an original indie-pop-rock score, inspired by the Cereal Killer Café and the 2015 Shoreditch riots, featuring book and lyrics by Jacob Dorrell and Tom Ling, music by Adam Dickinson and Jennifer Hague. SPILT MILK explores the themes of community, acceptance and belonging in an ever-gentrified East London. EVER ONWARD is inspired by Sutton Vane's play "Outward Bound" with a book by Susannah Pearse and music and lyrics from Tim Connor. Set in the Autumn of 1925 as Britain mourns loved ones lost in the First World War, a luxury cruise ship sets sail. But why are there only five passengers on board? And where are they heading? Creatives Connect on Wednesday 13 September, 8.30pm - 10.30pm; Pitch Days on Wednesday 11 October, 10.00am - 4.00pm; Open Mic Nights (in association with The BRIT School) on Monday 25 September, 9.00pm - 10.30pm and Musical Bites (in association with Mercury Musical Development) on Thursday 5 October, 8.00pm.